EA announced that Star Wars: Fallen Order would not feature micro-transactions and the market was not happy. Given what happened last time they tried this, management is making a very wise move. The game could still be a massive revenue source without in-game transactions as proven by Spider-Man and Red Dead. Financial performance is strong and EA is wise to avoid creating a scenario where their live services sales are put at risk again. EA is a strong buy with significant potential for upside. 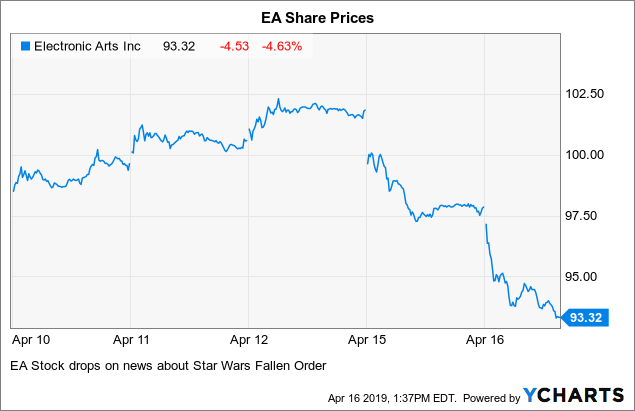 Electronic Arts shares have suffered in recent days, in part due to a Tweet the company made about its upcoming Star Wars title, "Fallen Order". The company announced the game would be a single player adventure, and would not feature any predatory monetization practices. Wall Street immediately reacted negatively, raising concerns it would not be as profitable as the last game. While many see this announcement as a cause to panic and sell their stake, I see it as an overreaction creating an opportunity to buy. A few years ago, Electronic Arts (EA) was granted exclusive rights to produce content for one of the most popular franchises of all-time, Star Wars. The intellectual property "IP" is so valuable, in no small part to the film series infamous devoted fans; many of whom have been known raid toy stores for the latest merchandise well into their 40s (something I've seen first hand in my childhood). While an eccentric, devoted fanbase means a built-in demographic of loyal customers, their passion can turn from a blessing to curse, very easily and very quickly. EA learned this lesson firsthand in 2017 when they attempted to implement the intrusive monetization system that they've long used in titles such as FIFA, into Star Wars Battlefront II- a first-person shooter title coinciding with the release of the Disney (DIS) owned Lucasfilm tentpole, Star Wars: The Last Jedi. Battlefront II was the sequel to their first offering, Star Wars Battlefront, which had released two years prior. The game allowed players to recreate classic battles from the Star Wars original trilogy (1977-1983), in large online multiplayer settings. The game was accompanied by a "season pass" one could purchase for a premium, allowing players to access new content periodically in the year following the game's release. While this may seem innocent enough, the game was criticized by many for feeling incomplete, lacking a single player story, and having a limited number of online maps (for the $60 price tag). EA quickly addressed these criticisms during the production of the game's sequel promising a more complete experience, with no additional charges for DLC content. Fans rejoiced, but, as is often the case in life, there was a catch. The game utilized a "loot box" progression system that offered the players the choice of playing for literally thousands of hours or paying money to unlock content they desired. The worst part was that the content was completely randomized, meaning you could spend hundreds of dollars and still not have anything you wanted. Unlike the FIFA fanbase, the fans of Star Wars were not as understanding of their premium games being used as recurring revenue generators for EA, and they quickly started a campaign against loot boxes and labeled the game a "Star Wars themed gambling casino for kids", which quickly got the attention of international legislators, and the Walt Disney Company. EA was told to clean up their mess immediately, or Disney would pull their exclusivity deal as an act of damage control. The problem was, EA had already promised the game would feature a continuous stream of new content for free (being paid for by the excessive paywalls on progression), which put EA in the terrible spot of having to pull their revenue stream and continue to work on the game without charging for updates. I want to preface this by saying that EA has now gone two years without a Star Wars game featuring loot boxes, so this development is not a material change for the company. 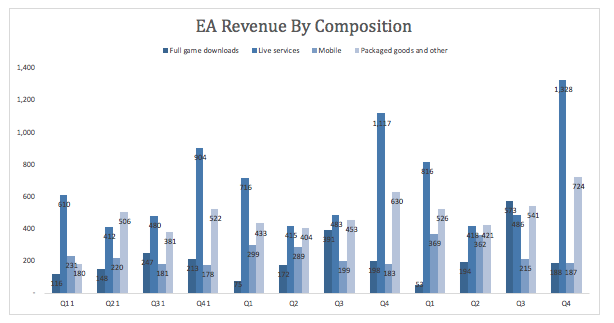 That being said loot boxes and the recurring revenue stream they create has been beneficial to EA and its ability to grow in the past. That being said, these products are not critical for a successful game, nor is online gameplay. To prove this point, I direct you to two titles from the previous year: Marvel's Spider-Man for PS4 and Red Dead Redemption II. Spider-Man PS4 is a single player game allowing players to free-roam as they complete the main storyline which is accompanied by side quests. In its first weekend, the game sold a record number of copies. Similarly, Red Dead Redemption II is a free-roaming single-player title, which managed to bring in more than $725 million in 3-days. If Star Wars can pull off a similar feat, which it certainly has the potential to, you won't see many complaints about the lack of loot-box monetization in the title. 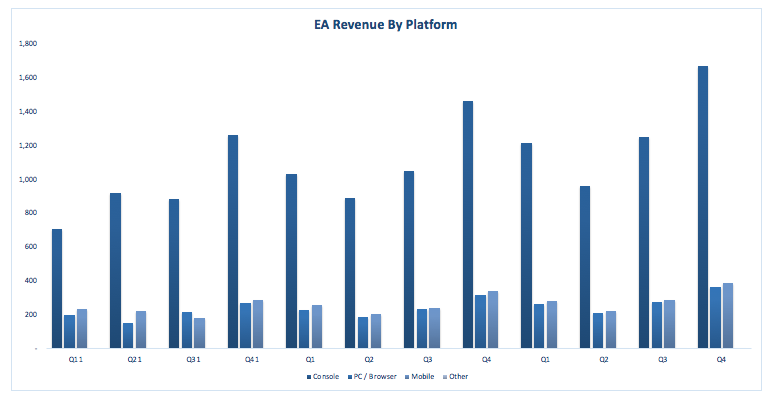 In order to justify why I think EA is I buy, I have made some projections for the company's financials. EA reports its revenue not only in a gross figure but also by composition and platform source. The chart above represents the company's revenue by composition from Q1 FY 2019 to Q4 FY 2021. As you can see, live services (read in-game monetization) is extremely important to the brand, which is likely why the news the upcoming Star Wars title would not feature this, led to a decline in shares. That being said, full-game downloads and packaged goods & other services are a close second in importance to the bottom line. Given a game like Star Wars, absent of live services monetization, has the potential for high volume unit sales, and that the presence of this feature could lead to another controversy jeopardizing this revenue source, this actually should be viewed as a huge positive for the company. Much like the previous chart, the graphic above extrapolates my projected earnings from Q1 FY19 to Q4 FY21, but this time I am looking at the platform. Although PC and mobile gaming are popular and will continue to grow, I still expect traditional gaming console revenues to make up most of the company's earnings. With these assumptions out of the way, I can build out my statement of income (see below). I am using the discounted cash flow method to set my 12-month price target on EA. The table above details my assumptions for annual free cash flow, cost of equity, cost of debt, and its tax rate. Above is a sensitivity table outputting the weighted average cost of capital that will be used in my DCF calculation. The model outputs a range of 9.69% to 10.93%, with 10.30% being returned as the most likely output from my two base assumptions for debt & equity cost respectively. Finally, the sensitivity analysis which represents the output range of results from my DCF is directly above. The table outputs a high bullish outcome of $135.24 and a low bearish outcome of $113.53, with $123.44 as my expected value. EA has a lot of upside potential and I feel it's being sold off for the wrong reasons. Even the worst-case scenario represents a massive ~20% upside potential at the time of writing. I am very confident in the company's future performance and I do not think it will remain at these "sale" levels for long. I am giving EA a strong buy with a price target of $125. Disclosure: I am/we are long EA. I wrote this article myself, and it expresses my own opinions. I am not receiving compensation for it (other than from Seeking Alpha). I have no business relationship with any company whose stock is mentioned in this article.